thank you, Katie Kelly Bell! posts by Anneli Rufus re Truffle Artistry Awards...Go Oakland! a huge thank you to the 12 Tasting Panel Judges! 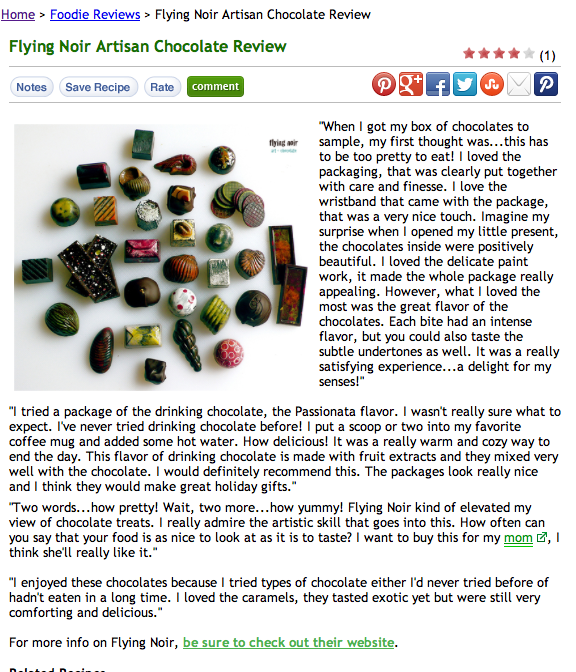 cool digital mag CONDIMENT likes flying noir bars! 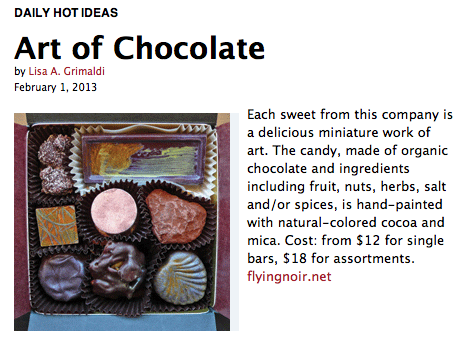 Flying Noir products were developed by a female artist from Mendocino, Calif., who gave up making art during the recession and became a highly regarded, passionate purveyor of micro-batch artisan chocolates. She does it all herself, using fresh ingredients and single-origin organic chocolate. In addition to exquisitely painted bon bons, she also creates original paintings on chocolate tiles and small batches of drinking chocolate.